Hi guys, it appears that the stars are aligning and making my decision to ditch Verizon for T-Mobile easier and easier. I have decided on the HTC One over the SG4. I do have a question about LTE coverage. I live in northern Monmouth County, NJ, and work in Hudson County, NJ. No one that I know has Tmo so I cannot ask anyone how their coverage compares to Verizon. Are there any fellow NJ people out there familiar with the area that can give me some idea of what sort of coverage Tmo offers? I have scoured the Tmo coverage map, and it appears that everywhere that I normally go has a good LTE signal, but I just want to be sure before I make the jump. Thanks for any information. Either find some friends wit T-mobile or test drive the network before switching permanently. This. Always worth grabbing a test device... Best way to test your area network. Yes, I think that what you and Mel recommend is the way to go. Do you guys happen to know tmo's return policy? I know that some carriers give a week or two during which you can return the phone with no penalties. I believe it's 14 days so you can test them out. Just be to ask the rep to be 100% sure. 14 days should help you with your decision . Jacksonville is great (where I am at) but may not be the same for you. Keep us posted! The CSR at the T-mobile store in Riverside, CA told me if you cancel your service and return your phone at the same time, they do not charge a restocking fee. Go into the store and let them know what you want to do. That's what I did. I said I need to test it to make sure it will work for me. In CA, I had 30 days to cancel / return. I kicked Verizon to the curb with their overpriced data rates. The only thing I didn't like about sprint is the contract. You're gonna be extremely disappointed with tmobile's customer service. I ordered my htc one on the 17th of july and my verizon account got cancelled by tmobile that day, but I didn't receive my phone until the 23rd of july. In order to have a working phone a went to a tmobile store and got a loaner phone from them and gave a 54.50 deposit for the crappy loaner phone. On the 23rd i received and activated my htc one and returned my loaner phone to tmobile and it is now the 31st of july and the 54.50 hasn't been credited back to my credit card. Today I realized that this htc one takes horrible pictures, they are blurry/ out of focus so i call tmobile to try to get a replacement phone. They tell me i have to return the phone, get a loaner phone again wait for them to receive it inspect it and send me another htc one. What a nightmare, I will never recommend this company to anybody i like. You get what you pay for. There is a reason why Verizon charges more money for their service. Well go back to vzw then smh. I on the other hand haven't had none of those issues and good coverage to match. Loving my htc one on t-mobile in Dallas. It's not the phones fault you can't operate the camera properly. Lol all you gotta do is tap to focus. I'm sure Verizon would have given you just as much hassle if you were in the same situation flipped the other way around. Before switching to T-Mobile last month I had at one time or another used the other three big carriers (in order: Sprint, Verizon, then AT&T) and so far I've seen no reason to be disappointed with T-Mobile. I really liked Sprint but I left them three years ago for the Verizon iPhone. Verizon was okay but too darn expensive! I switched to AT&T last year but after six months I left them after they said I hadn't paid my bill for three months and turned my service off. After some serious fussing and showing them proof they had debited my bank account along with their own emailed confirmation numbers they let me out of my contract (I really raised a stink). So far in the Dallas/Fort Worth metroplex I've had excellent signal coverage and I love my HTC One! Hey mikepas I'm on Dallas as well and I am very happy with T-Mobile as well. Jacksonville T-mobile here.. Loving it. 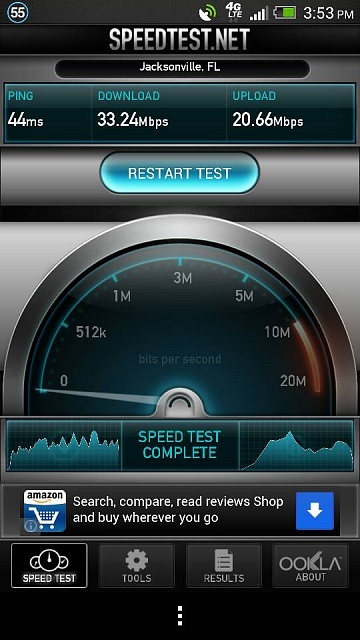 My LTE and HSPA speeds are great. I was on AT&T and Sprint... I'm loving T-Mobile the most so far . It should be credited back to your account on your next bill. I went to an actual T-Mobile store to get my phone & service & was charged the $35 restocking fee (plus tax came out to be like $40) & they credited it to my bill. I'm guessing you've probably already made a decision at this point. 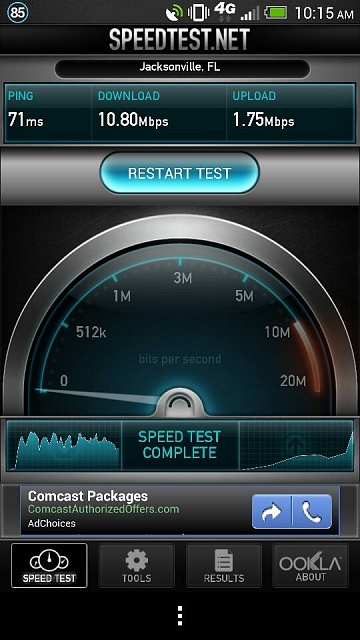 I live in Monmouth County as well and currently have devices all on T-Mobile, AT&T and Verizon. Verizon's coverage is definitely the best, with AT&T and T-Mobile being about the same for me. In general, I have decent coverage pretty much everywhere, but there are a few places where I've lost T-Mobile's signal when indoors. This is pretty rare though. They are still in the process of repairing towers from Sandy. They wanted to put in new towers, but the state forced them to repair the existing ones. So there are some areas closer to the shore that are still spotty, but those should be coming back online shortly. As others have said, the best thing to do is get a t-mobile device and test it thoroughly during the return period. BTW, I just cancelled AT&T and switched to T-Mobile. Selling my AT&T HTC One and getting the same on T-Mo Saving about $50/month. Is it possible to unlock with 4.1.1?